I ordered this during a work lunch, at Good Dish cafe in the basement of Bergdorf Goodman in New York City. Fancy, I know. It inspired me to make my own version. It’s my current snack obession. Too bad it’s not very portable! Toast the sesame seeds in a skillet (or frying pan); no need to add oil, just keep it quite hot and do not take your eyes away while constantly stirring – seeds are ready when they turn golden and fragrant. 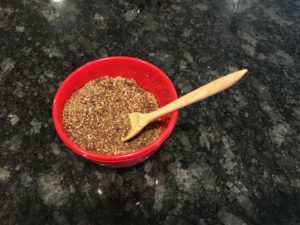 Grind the seeds and the rest of the ingredients together and you’re done! Arrange the toast on a plate with a side salad and enjoy! ps: a few drops of hot sauce on top of the avocado doen’t hurt but keep it light so it does not overcome the delicate za’atar flavor.